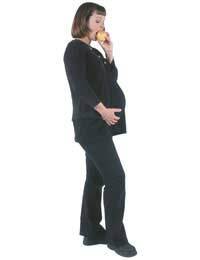 Home > Nutrition in Pregnancy > What Should a Vegetarian Eat During Pregnancy? A healthy diet and good nutrition are essential elements of a healthy pregnancy and some people may worry that being vegetarian may act as a hindrance. Luckily that’s far from the case and, as long as you eat a healthy balanced diet just like any one else, both you and your baby should be fine. Here’s a guide to the essential nutrients needed for you and your baby. Leafy dark green vegetables such as spinach, watercress, kale and broccoli. Wholegrains, such as wholemeal bread, brown rice and breakfast cereals. Pulses, such as lentils, chickpeas and beans. If you do suffer from anaemia during pregnancy, then it may be necessary to be prescribed an iron supplement. Don’t worry about this being just because you’re vegetarian, as that isn’t the case – women with any type of diet may require supplements. Protein is essential for both you and your growing baby. It’s good to eat dairy products rich in protein, such as cheese and eggs, but it’s not advisable to rely merely on these types of foods for all your protein needs. Instead, make the most of other vegetarian staples, such as beans, peas, lentils and wholegrains, and vary your diet. This will ensure you get a good balance of protein from a range of sources, plus they have the added bonus of being packed with iron, fibre and B vitamins too. 300ml of milk a day. In order for calcium to be absorbed properly, your body needs vitamin D. Oily fish is one of the main sources of vitamin D, but isn’t on the menu for vegetarians, so the next best dietary sources are butter and margarine. Alternatively, going out in the sun and being in daylight – even if it isn’t sunny – is great, as exposing our skin to sunlight creates vitamin D. If either your diet or lifestyle habits mean that you may have reduced levels of vitamin D, you may require a 10mcg supplement of vitamin D each day. Speak to your doctor or midwife if you’re concerned. The other vitamin that could be an issue is vitamin B12. B12 plays an essential role in forming blood cells. The main source is meat, although it can be found in some manufactured foods, such as soya products, but you may require a supplement, especially if you’re vegan. Again, speak to your doctor or midwife for advice if you’re concerned. Thousands of vegetarian women give birth each year, and many successfully bring up their babies as vegetarians, so it’s not something to be unduly worried about. As long as you take care with your diet and get all the nutrients you require, you should be on course for a healthy pregnancy.